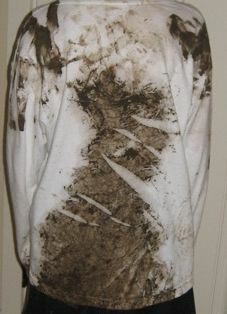 Have you ever been working outside and before you know it, you are filthy dirty with mud or grease all over your shirt and clothes? I have, and the first thing I want to do is go in, take off the old dirty clothes clean up and put on a nice clean fresh shirt! It feels so good to get out of the filthy stinky clothes! This analogy gives us a picture of what Paul was trying to tell us in Colossians 3 when he said to “take off” the old dirty, filthy self and “put on” the new clean self. This is the clean self that comes through a new life in Christ. No matter what I would try to do to feel clean and comfortable in my filthy work clothes, I just couldn’t until I changed them! It’s no different with us when it comes to new life in Christ. You use to wear the dirty clothes when you lived in them (Colossians 3:7). But now you have changed. Since you have accepted Christ’s sacrifice you now have “put on the new self who is being renewed to a true knowledge according to the image of the One who created him (Colossians 3:10). Forget trying to clean your dirty clothes or “old self” up, just take them off, throw them away and put on your “new self,” your new fresh clean clothing of love! This “Christ Life” isn’t about a list of do’s and don’ts but rather a life of being “endued.” The same Greek word (enduo) used in Colossians 3:10 for “put on” is also used in Luke 24:49 when Jesus told his disciples to “…tarry in Jerusalem until they be endued (clothed) with power from on high” (which we know Jesus was referring to the power of the Holy Spirit). You see, it’s about putting on the “right clothes” or the right “empowerment.” That’s the empowerment of the Holy Spirit! When we are wearing the clothes of God’s holy “love” we will by our new nature act like it. Have you changed clothes? Are you clothed with the new clothing of God’s power or are you still trying to wipe off the dirt from you old filthy clothes? God’s answer is to just change your clothes!